Air travel can be quite grueling. Both flyers as well as airlines will vouch for it. Everyone who’s travelled has had their share of stories – of being stranded in transit because of delayed delays, of being short served by customer service folks, of overworked attendants unhelpful at best and rude at worst, of luggage missing or mishandled and other operational hassles. Such stories are certainly not music to the ears of those who operate flights. Perception matters after all, with serious implications in real terms. People prefer to fly because of the convenience it offers. Airlines need to ensure a seamless and hassle-free travel experience, always, all times, for everyone, if they need to stay ahead of their competition. When pricing is no longer a differentiator, what else can they bet on other than delivering best-in-class experience for wooing travelers. Operational efficiencies and great customer service are what define a great airlines company. If you are looking to do something about bringing more productivity to the customer service function and operational effectiveness across the table, there’s a solution at hand: an Artificial Intelligence-powered chatbot. Already, reports indicate that 65% of holiday travelers and 69% of business travelers go online to plan their travel. About 92% of millennials are pleased with live chat and 23% are predicted to travel and spend $1.4 trillion by 2020. 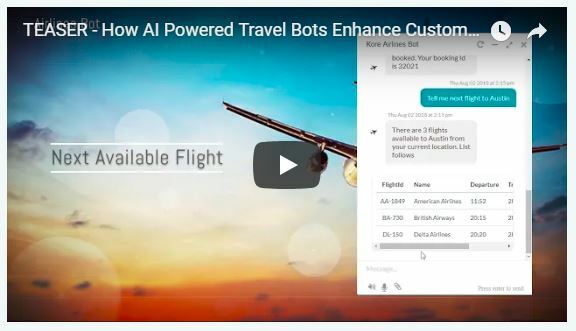 (Watch our latest video to know more on how airlines can leverage the power of AI-charged chatbots). Chatbots as Booking Assistant: The ticket booking process can be more seamless with a chatbot. As chatbot can learn from the booking pattern, it possesses ability to turn into your personalize booking assistant for frequent flyers. 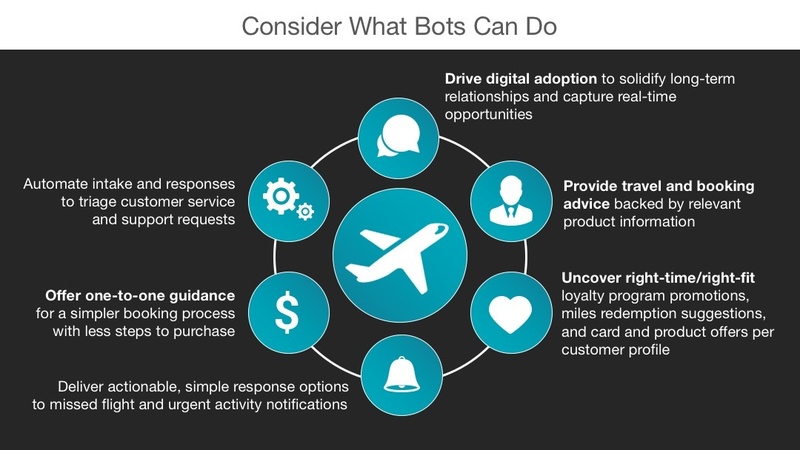 Chatbots as Customer Support Personal: Addressing the various frequently asked questions, chatbot can help airlines to improve the bottom line. Routine queries like flight schedule, check-in luggage enquiry, change of the name on the boarding tickets, ticket cancellation charges, extra luggage charges can be easily answered by a chatbot. Chatbots as Personal Assistants: The moment a traveler books a ticket, a chatbot can personally take care of his needs and provide him an experience that’s seamless and delightful. The activities that a chatbot can drive include web check-in, time to reach airport, boarding gate, change in flight time, nearest café information, nearby hotel details and booking, baggage collection belt number, change of gate notification, and security check whereabouts. Chatbots as Personal Grievances Assistant: With a chatbot available 24x7 on your device, there’s no more a need for waiting in queues and on phone lines. It’s a single touch point solution for all customer grievances be it luggage misplace, flight cancellation or any other scenario. Highly Robust: A complete end to end integration for all your simple to complex chatbot requirements. Scalable: Highly scalable solution in sync with airline industries demand. Cross Platform: Kore.AI provides platform agnostic solution, we support all the platforms say it windows, linux, android, or iOS. Omnichannel: Bots on the Kore.ai seamless work with all the channel say it messenger, skype, Telegram, and many more. Multilingual Support: Other than English our ML engine supports 5 major languages. Reduce Go-To-Market timeline: With lots of pre-built integration with some widely known enterprise solutions, Kore.ai reduces your time to market by 25%. Privacy and Security: We offer bots on cloud and on-premise solution, and have all the measures in place to address data and privacy concerns. Input Agnostic Bot Solutions: We support both text and voice input. Our enterprise-grade chatbot platform covers the entire ground customer journey experience for airlines industry. Unless you need support for travelers who are planning to visit Mars, you can always rely on us.